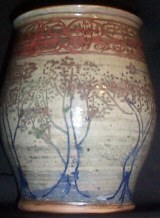 Glazes are the coating on pottery. They act to seal as well as give pottery it's texture, color and brilliance. The application of glazes is an art in it's self. 1. The Clay body of the particular piece. a. The firing temperature of the clay body. this factor will directly affect the finished glaze color. Left, same piece after gas firing to cone 10 in gas reduction. Hand carved band brushed with iron. The rest of the bowl was glazed with celadon. Study the glaze changes in these mugs. Notice how the pieces were glazed in the same way, however, there are differences in the pieces after firing.